Currently, it's bad weather in Tiel and it seems a good time to write on my blog. Before I started this post I read on Twitter the sad news of G4ILO. At that moment I was without words. I realize again that we have no influence on the duration of our lives. Last weekend I tried something to do with WSPR on 6 meters. On my FT817nd I had the wrong antenna connector set and therefore no results. Sunday, after I have switched this to the right connector my signal was heard by PAØO. Yesterday I heard also some signals but not spectacular. 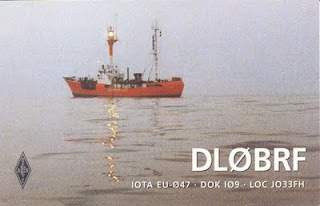 Meanwhile I saw that there was a large Es cloud hanging over Europe and there were many opportunities for qso's on 6M. At 16:01 UTC I made my first qso with LZ1QI. Then I had some other activities to do. At 18:57 UTC I discovered that there was still Es, now I toke te time to made a few qso's. Between approximately 19:00 and 19:30 UTC I worked with 6 different stations. 2 from Estonia, Hungary, Romania and 2 from Ukraine. All qso's made ​​with SSB or CW. 5 watts from my FT817nd with 1/4 GP on the balcony. Wednesday, June 8, was the monthly evening at the regional meeting of radio amateurs in Tricht to go. 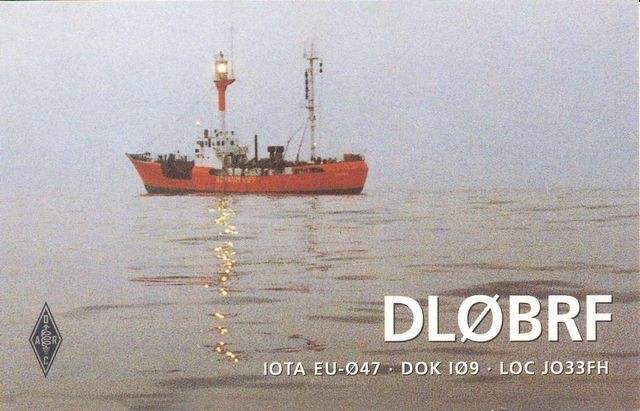 In addition to (social) discussions there is the possibility to receive qsl's and submitting via the QSL bureau. The number of cards for me was modest. 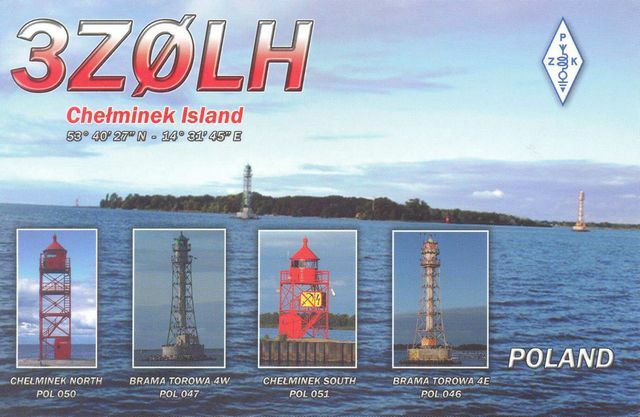 Besides some squares on 6 meters confirmed there were also 2 QSL's of a liighthouse and lightship. 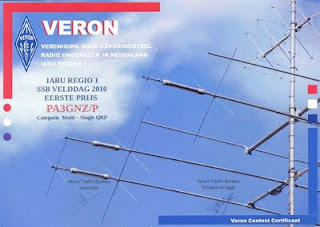 These were confirmations of QSO's made ​​in 2008 during my stay at the lighthouse of Vlieland. 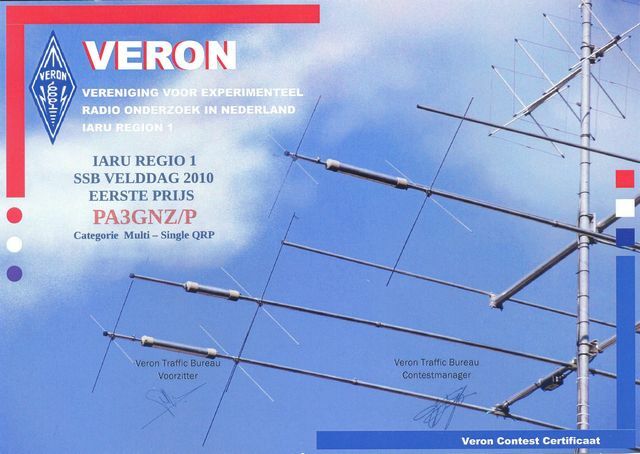 Almost three weeks long I have been QRV with WSPR on 6 meters. Not the full 24 hours but still fairly frequent. At the moments I was not at home my system was only listen. At home, I switched on the transmit mode. The overview shows which stations heard my signal and what I heard. To made the list not to long I used the "unique" tick on the website to generate this. The greatest distance is CN8LI, he heard me once with 1 watts output, SNR -23. As antenna I still use the 1/4 wave on my balcony. Last year I was a few hours QRV in the IARU Region 1 Field Day (SSB) contest. Despite the short time, I was in the QRP section finished at the first place (the only one in this section). Through a misunderstanding, I received a certificate that I was finished at the second place. Last week I received the certificate with the correct classi-fication. Today, Ascension Day, there was a radio-market in Laag-Soeren (The Jutberg). It's been several years since I had been here. Earlier this week we came up with the idea to go here. This just only with good weather. There was a lot of things not related to our hobby. In spite of this I found some nice items. For my this week purchased UV3-R I now have a real duoband antenna. Also found some adapters from female UHF to male BNC. Some weeks ago I came across an announcement on the internet about this 2 band pocketradio. Given the price and the possibilities it seems to me a nice gadget. Therefore I toke the step and place an order in Hong Kong. Yesterday I picked up the package at a collection point of our national mail carrier. What I noticed was that the box is very small. At home, I found everything in the box to which this order belongs. Meanwhile, the battery is charged and I programmed different frequencies. This is very simple. More experiences of this gadget will follows. An awkwardness I already mention. It's a radio for 2M and 70CM. For each band, a separate antenna included. So, no 1 antenna for 2 bands.